I tell Minnie about playing in two basketball games against local kids from St. Albans and Eccles, West Virginia. Thank goodness I have a little something to write about this time. I would write more often but I just hate to only tell about the weather & when I go on guard & how I wish I was home & how I want you, etc. etc. I went on guard last Friday morning as usual & again my post was one of those 4-hour ones. I was on the first relief so went first & was relieved at one o’clock. The post is about two miles from the main guardhouse so our dinner consisted of sandwiches & coffee we boiled ourselves. Having been out to another of those Y.W.C.A. parties the night before, I was afraid I would go to sleep on post that night so I tried to get some sleep but it wasn’t long before I was awakened by the fellows tearing around & raising merry – you know. About four o’clock the corporal of my relief came in & told me to put on my overcoat & bring my rifle. I didn’t know what was the matter because I didn’t go on again until nine o’clock. He & I went outside & there was another corporal & man to relieve us. The corporal said, “Knock a home run Griffing,” so then I knew that we were going in to play basketball. I tell you going on a basketball trip beats standing guard at night all hollow. We walked in & had to hurry & get ready to catch the river ferry up to St. Albans across the river. We finally got there because as someone said, that boat could meet a snail but it surely couldn’t catch one. We finally found the [St. Albans] school house, “ Yo’alls jest foller up yander & yo’alls will see it.” The court was awfully small – far smaller than the one we had been playing on so they had the advantage but we beat them. Actually that was the roughest & dirtiest & hardest fought game I believe I ever saw. Score 15 to 14. The score shows that to be a fact. After the game, we caught the ferry again & got into camp about 11:30. We didn’t eat any supper before the game so of course we went to bed supperless. I had just gotten to sleep about 12:30 when one of the players came & woke me up & said that we were to get up before six o’clock the next morning & go on another trip. Well, we got up about five thirty & woke a fellow to drive us down to the ferry landing in the Ford truck. It was too early for breakfast, so we lightened our belts & smoked cigarettes. The Lieutenant’s wife went along with him this time. She is an awful nice little lady. We woke up the ferry man & crawled up to St. Albans again & took the Interurban to Charleston. 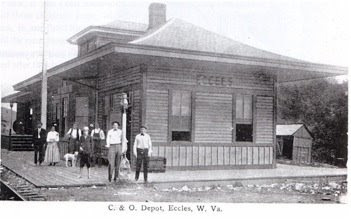 We didn’t have time to eat at Charleston but had to take a train out of there for the place where we were to play – a mining town away off in the mountains about 75 miles named Eccles [Raleigh County, West Virginia]. Well, that train went a little faster than the ferry but its speed was well under 75 miles per hour. The trip was very interesting & pretty even if we were hungry, tired & sleepy. [There were] lots of tunnels, cliffs, trestles & deep valleys. The hills were covered with pine & great tall spruce & oak. Lots of places the grass was green & ferns & holly were thick. It was very pretty even now in winter; I would certainly like to see it in summer. If I don’t look out tho maybe I will see too much of it in summer. We reached our destination about two o’clock & was taken to the hotel. “I reckon as how I ken put yo’alls up.” So we cleaned up & finally sat down to supper, breakfast & dinner all rolled together into a tough beefsteak. The town was in three or four parts – each part on the top of a [different] hill. The principle industries of the city were mining, loafing & railroading. 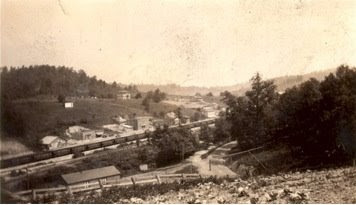 It happened to be the junction of two [rail]roads – one down in the valley & the other way up the mountain. The coal mine, however, was the thing. We were shown the hall where we were to play & then hung around the barber shop below awaiting our turns & listening to the wonderful tales of gunplay & fistfights. To hear them talk you might think that they were hard boiled but they didn’t take the trouble to molest us soldiers at least. We don’t usually eat before playing but we were still hungry & knew we couldn’t get anything after the game so we went back to the hotel & ate a light supper. Soldiers were quite an attraction in that town. The girls in the hotel got all ready & hung around trying to talk their heads off. They turned down the fellows who asked them to go with them & hung around watching us eat supper & when we got up they “wondered who all was going with them.” Well, we all didn’t ask them so I guess they must have gone alone. Well, those miner lads certainly had the goods on us. They beat us 18 to 43, but they played a clean & sporty game – lots better than the St. Albans team. We couldn’t start the game until after the [picture] show so we could get a crowd, so it was about eleven when we finished. We were one tired bunch when we went to bed that night & we didn’t get up until about nine o’clock Sunday morning. We decided to go back on the other [rail]road as it left at 10:30. We ate breakfast & climbed up the mountain to the station. Friday night before I left I got a nice long letter from you. Say kid, that was a peach of a letter. Please repeat dose each day until patient shows signs of coming back. About coming back, some of the men with Class A allotments have received their discharges. We hear that they are discharging the 10th very fast up at [Camp] Funston but as we are on duty & I don’t see who would relieve us, we may be stuck here for some time yet. This morning I received a box of candy & cake from the folks. They had a party & told me to imagine I was home when I ate the stuff. That was a little hard to do, sitting on a trunk with a bunch of fellows around seeing that you didn’t get more than your share. The piece I got was good anyway. The weather is simply wonderful here now. All day yesterday we rode on the train with the windows open & our overcoats off.